The longest election in Canadian memory has produced a new government and a decisive end to the Harper era. The reasons are not especially complicated: Canadians demanded change in Ottawa, and an end to the “politics of fear and divisiveness,” as Liberal leader Justin Trudeau told us repeatedly along the 78-day campaign. Polls throughout this time consistently backed him up. The question, until close to election day, was which of the main opposition parties—the Liberals or the New Democratic Party—could reasonably provide that change by defeating the Conservatives. Canadians answered it by giving Prime Minister Trudeau a majority in Parliament. The NDP entered the election in the lead. But an overly cautious campaign by leader Thomas Mulcair, a former Liberal environment minister in Quebec’s provincial government, failed to excite new voters while turning off a good portion of the party’s base. Mulcair was criticized for running to Trudeau’s right on some issues, despite having the more progressive platform. Instead of highlighting the party’s plans for a badly needed national pharmacare program he chose to front cuts to small business taxes. On climate change he was timid, endorsing an ineffective carbon trading scheme and wobbling between support for and opposition to a controversial east-west pipeline that would—if it is ever built, which is doubtful—carry Alberta bitumen to Atlantic ports for export. The NDP did at times highlight its promises to create thousands of new affordable child care spaces and raise the federal minimum wage to $15 an hour. But these and other pledges were bogged down in the usual media skepticism about where the money would come from, especially with the party saying it would balanced the budget in 2016. Frustratingly, for NDP supporters, Mulcair’s fiscal prudence was ridiculed by some of the same voices in the media once Trudeau took a page from Ontario Premier Kathleen Wynne’s election playbook by asserting the Liberals would run deficits to pay for their platform, profiting from historically low interest rates. Liberal and NDP support in the polls reversed at this point, putting the centrists within reach of the Conservatives and giving Trudeau the freedom to embrace deficit spending (up to $10 billion annually for three years) as a means of stimulating the stagnant Canadian economy. About a third of the new money is slated for social and green infrastructure, and new transit projects—staple proposals of progressive economists, including the CCPA. On one level this is classic Liberal strategy: when in danger, run from the left (then govern from the right). We can look for proof to Ontario, where Premier Wynne is privatizing part of the public energy grid and has embraced public-private partnerships for transit and other infrastructure. But at the same time there are good reasons to take Trudeau at his word (more on them later). The truth is that it probably didn’t matter to voters whose platform—the NDP or Liberals—was more progressive. In the end, this election was a referendum on the Harper regime, and voters turned out in the largest numbers since 1993 (68.5%) to soundly reject it, partly for Harper’s lack of economic imagination, mostly for his government’s downright meanness. Let’s look briefly at the record we can hopefully put behind us. After winning a majority in 2011, the Harper government waged an all-out war on civil society, parliamentary democracy, the environment, organized labour, First Nations, and anyone else that might pose an obstacle to its economic and social policy objectives. First among them was Harper’s plan to reposition Canada as a pro-business, deregulated, low-wage “energy superpower,” followed closely by the party’s ideological commitment to small government and low taxes. The Conservatives drained finances from public services and substantially downsized the public sector, while introducing labour legislation making it more difficult to certify (and easier to decertify) new unions. Services for veterans, and federal food and rail safety inspection suffered as jobs and funding were cut. The mythology of Canada as a peacekeeper was mutated by government propaganda into Canada the strong U.S. ally and warrior nation. Government scientists were muzzled, federal libraries closed, evidence ignored in policy-making (most infamously in the end of the mandatory long-form census), and government watchdogs fired. The federal relationship with Canada’s First Nations deteriorated to new lows despite a historic 2008 apology for the abuse suffered during Canada’s long residential schools program. Indigenous frustration with the Harper government’s intransigence on treaty rights, inadequate funding of First Nations infrastructure and social programs, and the outright dismantling of Canada’s environmental assessment regime gave way to the Idle No More movement. Electoral mobilizations followed. The national chief of the Assembly of First Nations, breaking a tradition of non-partisanship, said in September, “I will vote in this federal election in support of a government committed to closing the gap between First Nations people and Canadians. I continue to encourage all First Nations people to vote.” Indigenous Rock The Vote campaigns across Canada mobilized young people in huge numbers. Turnout was so much higher than expected in some Northern communities that they ran out of ballots. In a practice worthy of Nixon, the Harper government developed lists of “enemies” from civil society that were to be kept away from government decision-making, much of which took place at the very top in the Prime Minister’s Office. In parliamentary committees, when civil society groups challenged certain pieces of legislation—for example, the merits and risks of a trade agreement, anti-terror law, or reforms to Canada’s elections regime that risked disenfranchising tens of thousands of voters—their evidence was very frequently ignored. In some cases, Indigenous groups, environmental organizations and social activists who spoke out in the media were demonized by the government, threatened with defunding, and even likened to terrorists. Following attacks against military targets in Ottawa and Quebec a year ago, the government introduced omnibus security legislation in January (C-51) that sanctioned potential civil liberties abuses by state security agencies if they could argue that doing so would make Canada safer. Worryingly, the law expanded the network of government agencies responsible for collecting information on Canadians whose activities could be alleged to threaten national security, including Canada’s economic security. A consensus emerged among privacy experts, civil liberties advocates, and a list of former prime ministers and government officials that under these terms, nonviolent people asserting their right to contest major resource projects could find themselves on a terrorist watch list. 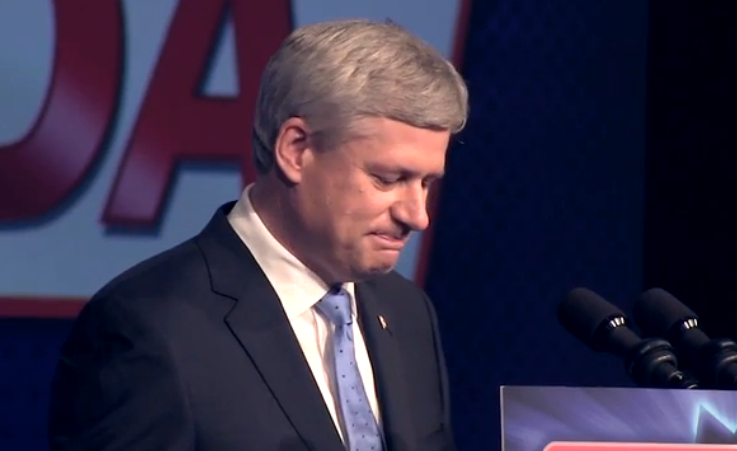 As a result, many Canadians felt targeted by Harper more than governed—especially Muslim Canadian. As the election drew close, the Conservatives ran a xenophobic campaign that disparaged Syrian refugees, fomented mistrust of Muslims, promoted contentious legislation that gives the government the right to strip Canadians found guilty of terrorism-related offences of their citizenship, and promised to forbid Muslim women from wearing the niqab during citizenship ceremonies or while performing public-sector work. The law and Charter rights be damned—Conservatives had an election to win. That fear mongering looked to be successful at first, but the negativity wore off, and the NDP—the party that most overtly challenged the anti-niqab campaign, waged in particularly ugly ways by the Bloc and Conservatives in Quebec—was unable to capitalize. By then, Trudeau was running an attractive, optimistic campaign on a promise to change more than the government’s policy direction, but the very way government interacts with the public. Strategic voting campaigns had limited if any real impact in the end. Trudeau appeared to be the least like Harper, and once his polling numbers reflected that, any chances the NDP had early on became dim hopes. At first glance, the Liberal victory could be seen as a superficial win for progressives, though some insist it is an outright loss. On many of the most important issues to social justice activists, the Liberals are out of line. For example, though he promised to set binding carbon emissions reduction targets in November’s climate talks in Paris, Trudeau has publicly supported the Keystone XL pipeline. His party endorses the yet-to-be-ratified Canada–EU Comprehensive Economic and Trade Agreement, and will almost certainly back the Trans-Pacific Partnership (TPP), even though it may compromise future Liberal stimulus measures. Instead of a national child care plan, as the NDP has been proposing for some time, the Liberals promised bigger (and undoubtedly important) monthly cheques to families with children from all income levels. Meanwhile, the NDP is reduced to 44 seats in a Parliament where Conservatives now form the Opposition. With few exceptions, Canada’s daily newspapers endorsed Stephen Harper for a fourth term on what they thought to be the strength of his economic policy. He was a jerk, but he was “our” (the One Per Cent’s) jerk, they implied in editorials shrugging off the government’s anti-democratic tendencies. All of this, and the Liberals’ intimate connections to corporate Canada, will create significant rightward pressure on Trudeau, despite his having run on a progressive platform. But in an important way, the worst is almost certainly behind us. The change in governance and mood was immediately apparent. Trudeau has promised some public scrutiny and debate of the TPP in Parliament after the text is released in November. He said his party has already started to negotiate with First Nations on an inquiry into missing and murdered Indigenous women. And he used his first conversation with U.S. President Barack Obama to announce that Canada would be pulling its CF-18s out of Syria and cancelling our participation in the F-35 fighter jet program, a costly priority of the U.S. military-industrial complex. The Liberals may also make Canada the first country in North America to legalize marijuana. Canadians have not elected a reflexively progressive party, but we do now have a government committed to implementing a largely progressive platform that will improve many people’s lives. We also have an opportunity, where none existed between May 2, 2011 and October 18, 2015, to revitalize our democracy—if enough leftward pressure can be mobilized outside of Parliament and the corporate media. The CCPA is not an advocacy group, but as Canada’s foremost non-partisan progressive think-tank we are in much better position today than we have been for some time to influence economic, social and environmental policy in the short, medium and hopefully long terms. Onwards. Stuart Trew is the editor of The Monitor, the CCPA’s national magazine, and a co-editor (with Teresa Healy) of The Harper Record 2008-2015. A version of this article appeared in Foreign Policy in Focus on October 28. Follow Stuart on Twitter @StuJT. Daniel Kahneman, in _Thinking: Fast and Slow_ refers to retroactive justification–how human beings love to retroactively find a story to shows that the winner deserved to win. No one likes a fluke, but I suspect that more than anything else the NDP was torpedoed by the fact that Harper’s niqab trap had more impact in Quebec, where there was a (thought to be) progressive-but-anti-niqab party (the Bloc) to worry about and the flames of Islamophobia had been carefully fanned by the recent Parti Québécois government. Thus NDP poll numbers took the brunt of the blow and “momentum” shifted to the Liberals. All the dumb things the NDP and Mulcair did might well seem insignificant if Harper’s trap had involved something that hit harder in the Atlantic provinces or Ontario. In that case there’s a good chance we’d all be looking at a different set of screwups on the Liberal side, all of which combined to make the NDP richly deserve the win it received.